Meteorology Department officials warned of incessant rain and thundershowers throughout the country today as well due to a low pressure area developed in the vicinity of Sri Lanka. The Department duty forecaster said the low pressure area, located over Batticaloa coast yesterday was likely to intensify further in to a depression. However it is expected to move away from Sri Lanka by today towards India. 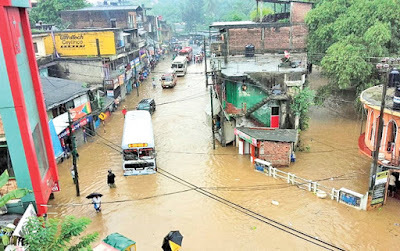 Heavy rains lashed throughout the country yesterday and many roads were inundated. The National Building Research Organisation (NBRO) issued landslide warning for several areas in eight districts due to the inclement weather conditions. The eight districts are Badulla, Monaragala, Kandy, Ratnapura, Kurunegala, Nuwara Eliya, Kegalle and Matale. Irrigation Department officials said five spill gates of Daduru Oya and four spill gates of Weheragala resovoires were opened due to incessant rains. The people living down stream were advised to be vigilant over the rising water levels. The highest rainfall of 145.8mm for the 24 hours ending yesterday noon was recorded from Pottuvil while Colombo received a rainfall of 76.4mm and Trincomalee 90.2mm. Meanwhile, motorists using the Hatton-Nuwara Eliya road are advised to drive cautiously due to the heavy mist. “Cloudy skies and showers or thundershowers are expected over most parts of the island. Very heavy falls (around 150 mm) are also likely at some places. There may be temporary localised strong winds during thundershowers. The public is requested to take adequate precautions to minimise damages caused by lightning activity,” the weather forecast issued by the Meteorology Department stated. It further said sudden roughness of the sea areas associated with sudden increase of wind speed (up to 70-80 kmph) could be expected over the surrounding sea areas of the island. “Intermittent showers or thundershowers will occur in the surrounding sea areas of the island, particularly in the Northern, Eastern, Southern and Gulf of Mannar sea areas. Winds will be North-westerly to Westerly along the sea areas extending from Kankasanthurai to Hambantota via Puttalam and Galle, andSouth-westerly to South-easterly elsewhere. The wind speed will be 40-50 kmph and can be strengthen up to 70 kmph at times,” it stated. Two people have gone missing and over 7,000 are affected due to the torrential rains experienced due to a atmospheric disturbance. Two people bathing down stream are reported missing after a private power generation facility in Kegalle had reportedly opened gates of a tank located in Gurugoda Oya.